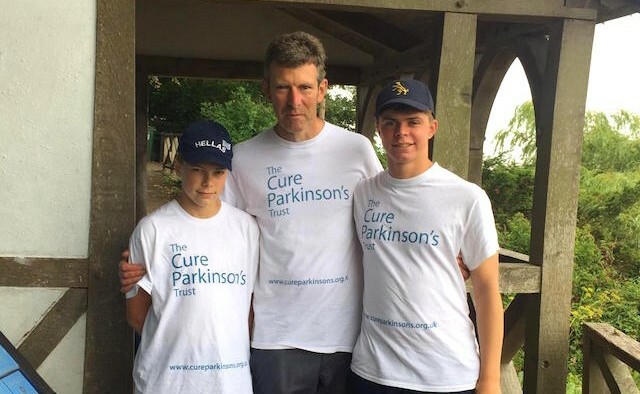 Where did you get the motivation to walk Hadrian’s Wall and raise money for The Cure Parkinson’s Trust? I guess it was from being diagnosed with Parkinson’s and having the feeling that I’d not done anything about it. So I decided it was time to do some fundraising. In October 2010 at the age of 47. I don’t really know what the first symptoms were, but the obvious one was that I had started to experience restricted movement in my left arm. A few people had noticed it and that persuaded me to go to the doctor. How did you feel after your diagnosis? It felt like a bombshell had been dropped on me in terms of being diagnosed and also knowing about the complexity of the condition – and the fact that there’s no cure. Two of my neighbours at different points in my life had Parkinson’s and they were both older than me. Aside from that, I suppose I didn’t know much about it. So you assume the worst, but the support’s been very good and there’s plenty of information out there. Who did you complete the Hadrian’s Wall walk with? My immediate family. I was joined by my two sisters, my brother, my brother-in-law and two of my sons. My mother also joined us at the end of the week. What worked well was that we all knew what we were there to do and we all had the same mentality. We made the decision to walk for six days, so it was a case of getting up and getting on with it. In total it took six days from start to finish. That’s 174,000 steps. Did you do anything to prepare for the walk beforehand? Yes – I walked! I knew we’d be walking between 12 and 15 miles a day and so I started practicing long walks on the weekend. I live in Suffolk, which isn’t known for its hills or mountain ranges, so I found a village that was six miles away from where I live, and I’d walk there. My two sons didn’t do any training at all. I think my middle one probably walked half of Hadrian’s Wall without even tying his laces. 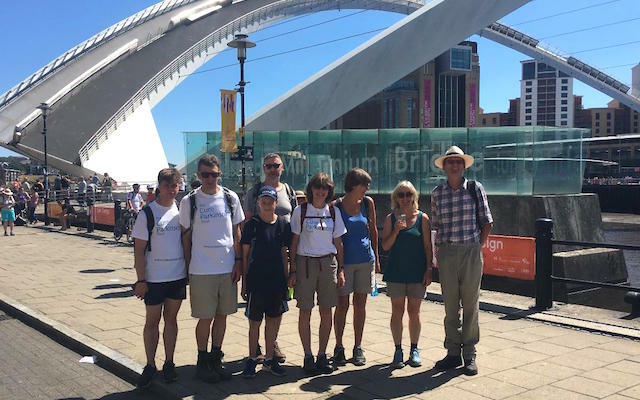 John and his family began the walk in Newcastle, UK. 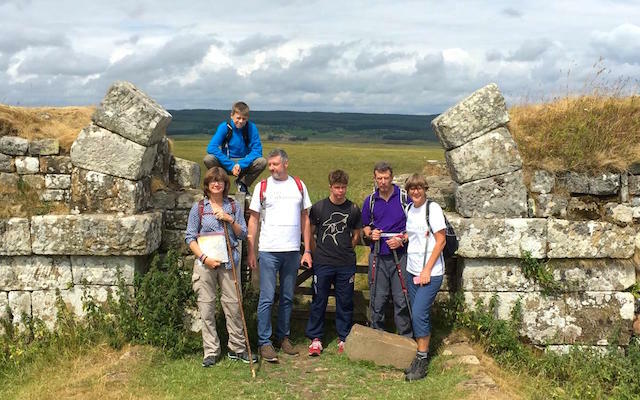 Completing it, seeing Hadrian’s Wall and spending time with my family – and obviously raising money for and awareness of Parkinson’s. What aspect did you find most challenging? I found days three and four quite physically demanding, particularly in the afternoon. We walked a couple of days without rest which, in hindsight, maybe I should have added to the agenda. Occasionally, I took it at a slower pace even if it meant the day lasted longer. Despite spending a lot of time trying to get fit, I am not as mobile as I would like to be. Did you receive a lot of support? It has been fantastic in terms of sponsorship, donations and moral support. I’m humbled by the amount of money people gave to our cause. The Cure Parkinson’s Trust helped me with the publicity beforehand and gave me a few pointers on setting up a page on fundraising website Virgin Money Giving. Initially, we had aimed to raise £10,000 – but we ended up raising £37,000. I’ve also got friends who cycled 960 miles across the UK from Land’s End to John O’Groats to support the cause, and they’ve probably raised £5,000 between them which is brilliant. Do you have any future plans for fundraising challenges? I’d certainly do something to raise money for charity again, but I’ll probably leave it for a year or two as people have been so generous. If I were to do it again, I’d try to contact more people and raise more publicity, maybe on social media. I’d love to see the Great Wall of China and walk some of that. What advice would you give to somebody considering fundraising for Parkinson’s? Definitely do it. It’s good to try and keep fit and set yourself a challenge. Hopefully the money raised can be put into Parkinson’s research and other worthy causes. I’ve found that people are generous and want to help, they just need a little push! What are your hopes for the future of Parkinson’s research? That we can find a cure. If that could be achieved, it would be fabulous. John and his family on day four of the walk.